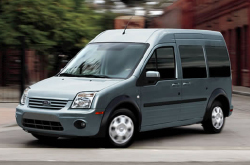 Peoria Ford is pleased to offer an in-depth 2013 Ford Transit Connect review for Phoenix-area commercial operations. The information below reveals why Transit Connect is a superior choice for a field service vehicle. The Wagon will carry a five-man crew, while rear seats fold-and-flip when not needed in order to provide extra cargo space. The 2013 Transit Connect's dual sliding doors and low loading height make it easier to load and unload heavy items. Phoenix business owners will find Ford's high-tech vehicle tracking and monitoring systems extremely useful. With the Phoenix metro-area covering more than 9,000 square miles, it's incredibly important for service and delivery vehicles to be as fuel-efficient as possible. The Transit Connect offers 22/27 mpg ratings for city and highway the best in its class. Find out more about Transit Connect in the video below, and please contact us at Peoria Ford with any questions you have about available Transit Connect Vans in Phoenix. Compare the 2013 Ford Transit Connect next to vehicles like the 2013 Nissan NV, Ford Econoline, Mercedes Benz Sprinter, Chevy Express and the RAM Cargo, and you'll notice that the Transit Connect outshines the competition in gobs areas. View our Quick List below to find out why! Feel the [resassurance] that comes along with receiving quality repairs by Ford trained technicians, a complimentary warranty on all work, and reliable Ford parts. At our Phoenix area repair center, this and more is available for Ford Transit Connect drivers. Peoria Ford's auto repair whizzes will make your Transit Connect run strong, so take it to our Ford car maintenance unit in Phoenix today. Whether you need us to get a handle on a simplistic situation as an oil change, or take on hard to do Ford service and repairs like transmission rebuilds, strut and shock repairs, timing belt replacements. From the straightforward to the complex, Peoria Ford deals with it all and offers reasonable prices, one of a kind service and old pros mechanics. Check out the link below to see how much money you can save on your next service appointment. 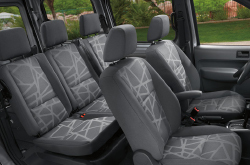 Consider the versatility and economy of the 2013 Ford Transit Connect for your Phoenix service fleet; the features and options listed above are just a sampling. Customizable cargo area configurations for storing tools, parts or other equipment offer myriad customization choices. You can equip your Transit Connect with rooftop ladder racks, storage cabinets, dividers, double floors, drawers and the list goes on. The four-speed automatic transmission is engineered to handle tough commercial use and provides the low-end torque needed for running fully loaded. AdvanceTrac® With Roll Stability Control™ (RSC®) is standard in all models to keep your personnel safe on the road. Other standard safety systems include front and side-impact airbags for the driver and front passenger, along with tire-pressure monitoring delivered via instrument panel alerts. Transit Connect offers a compact, adaptable, maneuverable and durable service vehicle at an affordable price with ongoing savings at the pump. Come see us at Peoria Ford and allow us to provide additional reasons your Phoenix business should opt for the 2013 Ford Transit Connect.